Christmas rail chaos endured by commuters at Finsbury Park station precipitated an apology from Network Rail Chief Executive Mark Carne, as well as a renouncement of his annual bonus. Thousands of passengers had their journeys disrupted following the overrun of engineering works at Kings Cross Station in late December. Some customers were even unable to disembark from carriages due to serious overcrowding. The controversy lead to Mr Carne appearing in front of MPs on the Commons Transport Committee to try to explain what went wrong. Rail travel is an issue which continues to provoke controversy. Commuters have once again been forced to accept yet more increases in price recently. Public exasperation with Network Rail in particular, appears to have been increased still further with this latest incident. I can use YouGov BrandIndex data to analyse the damage the furore has had on the already much maligned brand. Our Buzz metric (whether a respondent has heard something positive or negative about a company in the last two weeks), shows a dramatic decline in Network Rails’ fortunes since news of the delays were announced. We see that the score fell from an already low -2.8 mid-way through December, to a low of -30.8 at the beginning of the New Year. YouGov’s Index Metric further underlines the damage the incident had on the company. The metric is made up of a variety of factors including value, satisfaction, quality and reputation. Again we see a sharp decline in the score achieved by Network Rail. At the same time as before, the score was -1.3, declining to a low of -12.2 early in January. 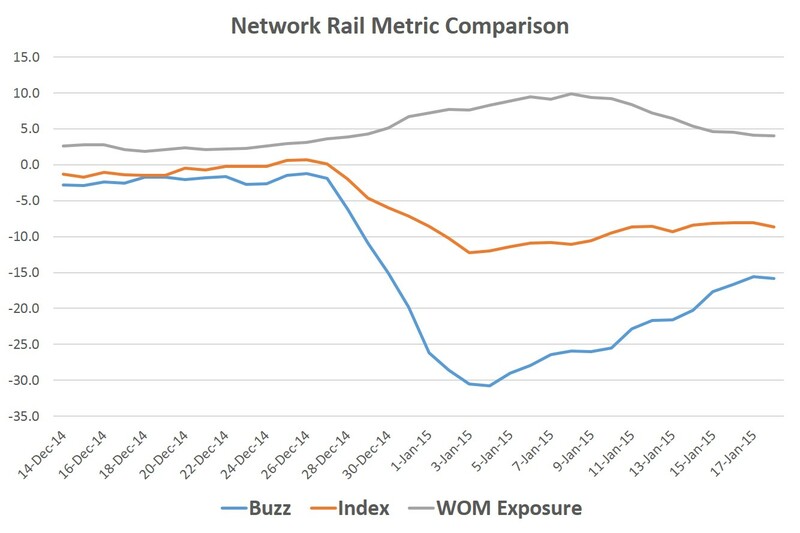 Unfortunately for Network Rail, one area in which our data shows an incline is in WOM (word of mouth exposure). This suggest that the public were talking with friends or family about the matter. It shows that it is an issue that many feel important enough to discuss. The score for this particular metric rose from a relatively low 1.9 in mid-December to a high of +9.9 a week into January. It is clear therefore that the operator has a long way to go to restore the trust and confidence of the public. How long consumer patience will last if delays and price rises appear in tandem remains to be seen.